The first image is a standard test image. The second image was artificially produced by someone else ((Lena Blurred and Noisy) http://telin.ugent.be/~frooms/friep/screenshots/), presumably from the first image or one like it. 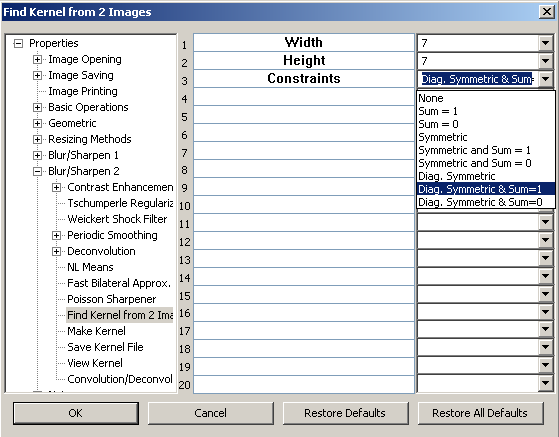 The goals are to estimate the convolution kernel and use it to deconvolve the second image. Make only the Y channel active by pressing keypad 5 and 9. The status should be displayed in the 3rd pane of the status bar. Press X to create second layer. Click Blur/Sharpen>Find Kernel from Blurred and Sharp Images. Note in row following "7, 1," only the first value is relatively large. That indicates that we can approximate the kernel to increase the speed of deconvolution. Close Note Pad. and note the PSNR, 32.190266, shown in the 5th pane of the status bar. Note that regions of the width of the kernel, in this case 7 pixels, next to the image borders, are ignored in this PSNR calculation, in order to ignore unavoidable artifacts in this region. Compare with results published at http://telin.ugent.be/~frooms/friep/screenshots/ For example, to get PSNR of lena512-Gauss-GaussianNoise-RichardsonLucy-TV.png, open this image and leave the first image in the bottom layer. 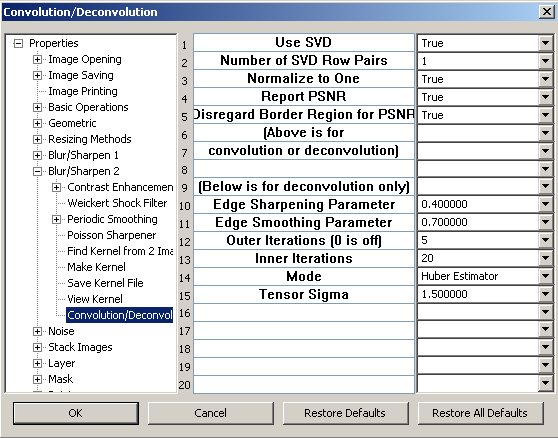 Click Blur/Sharpen>Deconvolution by PseudoLAD and set the Outer Iterations, on line 12, to 0 which will turn the deconvolution off. After clicking OK, the PSNR will appear in the status bar. I get 31.712722 .